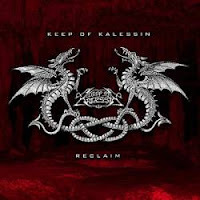 Keep of Kalessin are in the big time at the moment, as it seems to me. "Armada" was thrilling and majestic, "Kolossus" epic and monumental, and "Reptilian" in general is a worthy successor. But between "Armada" (2006) and it's predecessor "Agnen. A Journey through the Dark" (1999) there is a gap of seven years. The small EP "Reclaim" fills this gap with some fine songs, harsh but progressive black metal, and with the great Attila doing the vocals. I wouldn't mention this EP, if there weren't some fragments of latin in the lyrics. gigni de nihilo nililum, in nihilum nil posse reverti - Nothing can be born of nothing, nothing can be resolved into nothing (This is a phrase written by Persius, a Roman author (1st century a.d.) of dark, hard to understand satires). exegi monumentum aere perennius - I've raised a monument more permanent than bronce (originally from Roman's famous poet Horace, Ode III, 30, praising his own poetry and claiming that his fame will last forever... where he's actually right because after more than 2000 years he's still (beside Vergil) the most famous and valued Roman writer). So let us hope that Keep of Kalessin as well exegit musicam aere perennius.